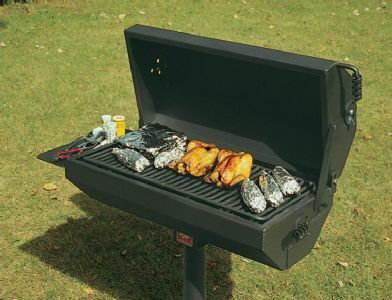 This covered large BBQ grill features a 320 square inch cooking grate for weekend barbecues in the park. Measures 19.5" x 29.25" x 16.5" with 3 1/2" OD post that is 40" long with an inground mounting post. Our covered park grills hold in the smoke and heat to give food that great smoked flavor. Covered grills also keep rain and snow out of the firebox to prevent rusting. 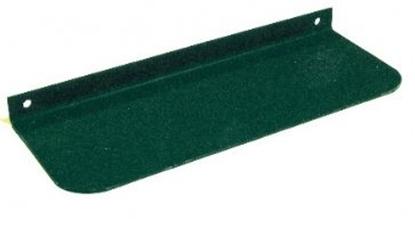 Features a utility shelf and 1/2" dia. steel bars which are non-removable but can be tipped out for easy cleaning and have adjustable vents on the firebox to furnish draft control and on the cover to control smoke containment and venting. Our patented standard base attachment provides further draft control by allowing 360 degree rotation of the grill. 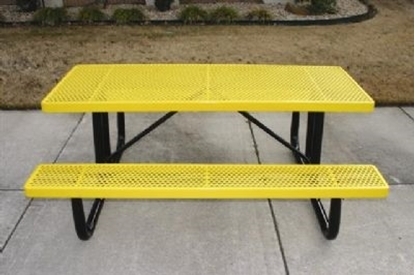 Rectangular 8 foot Thermoplastic Steel Picnic Table, Ultra Leisure Perforated Style, Seats 8 Adults, 323 lbs.